#Office365Challenge VLOOKUPS are used to retrieve data from other tables or ranges by row. A common field is needed to match and return stated values. In my example I have 3 different tabs in Excel. Once where I will populate an invoice, one where I will find unit of measure and price and another where the stock is found. The text it must match – must always be in the leftmost column of the table – to retrieve data to the right of it. Take note of the use of “,” or “;” in the formula. 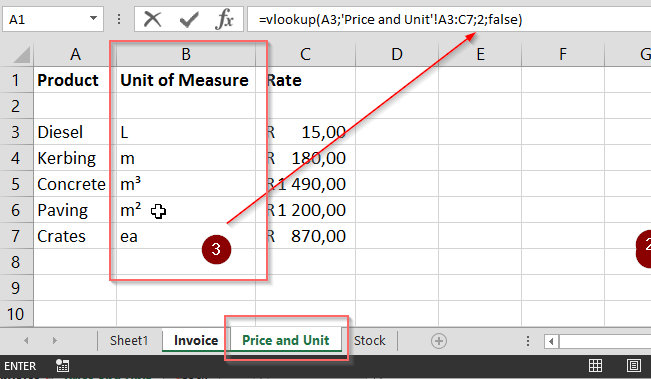 Join me tomorrow when we’ll take a look at VLOOKUP formulas.